In her 50s, Sue Nyhus discovered that golf courses were getting longer. That happens to a lot of golfers, right? In her case, it was not merely her imagination or the effect of age. The UGA has lengthened the setups for women, creating tougher tests for elite players. Nyhus continues to thrive, playing longer courses in events such as the UGA Women’s Stroke Play Championship and the Mary Lou Baker Open. She found it refreshing, though, to play from the forward tees in the Women’s Senior Amateur at Hill Air Force Base’s Hubbard Golf Course. The short setup partly explains why she made two eagles in the second round, although no disclaimer is needed for shooting a 67. Coupled with her opening-round 72, Nyhus won the event by nine strokes, symbolic of her strong showing all season on the way to the UGA Senior Women’s Player of the Year Award. Nyhus then competed against mostly younger players in the U.S. Women’s Mid-Amateur in St. Louis and advanced to match play, even while having to hit long clubs for her approach shots on par-4 holes. Amid her duties as the Utah Valley University women’s golf coach, playing in tournaments is “a good escape for me. It’s the one place where I have to keep my focus on what I’m doing,” she said, as opposed to worrying about her job all the time. 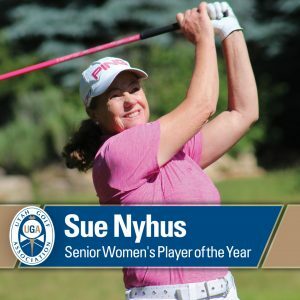 Playing courses she enjoys, Nyhus tied for seventh place in both the Stroke Play (Hobble Creek) and Mary Lou Baker (Wasatch Mountain) tournaments. She shot 77-76 at Hobble Creek and 73-72 at Wasatch.